And have to pass on, BECAUSE THEY’RE SO DAMN FUNNY!!! • The zombie kid with the turtle obsession. Listen to this and then cue up Johnny Cash doing “The Man Comes Around” from American IV. Brrrr. (P.S. The reporter’s stunned reaction is priceless.) Thanks to benchilada for giving me this one. • Playmobil Security Check Point. Playmobil seems intent on representing all sides of our legal system in toy form, everything from airport security to police radar stations, from safecrackers to SWAT choppers. • The Vader Sessions. Did you know Darth Vader appeared in a number of 70s blaxploitation flicks? Dig it. • “Write this..or that..or maybe…” Brit comedians Mitchell & Webb do a hilarious spin on an editorial meeting. • In the category of cute animal stories, I’m reduced to expressions of “awwwwww” by the tales of Owen and Mzee and the grateful lion. The guy’s expression is priceless, but what makes it funny to you? the fact that he’s mugging for the camera, or the fact that he’s wearing a helmet? are you laughing at or with him? Ok, that’s cool. I saw a mentally retarded adult being held out as funny for looking goofy, but I’m clearly overreacting. gotcha. I thought that was a seizure helmet. 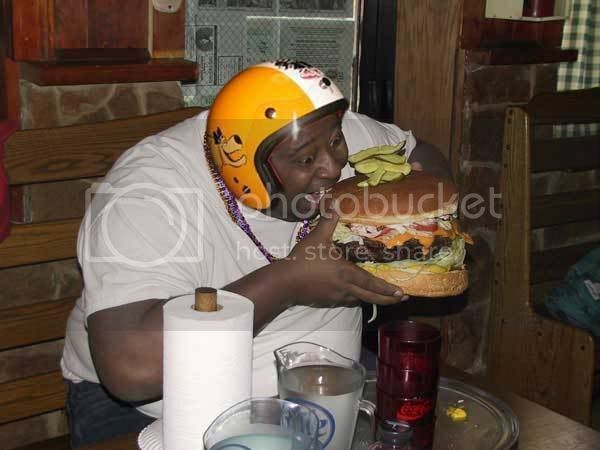 Didn’t realize it was an EATING helmet. ← "A.D." Chapter 10: "Something In The Water"